Kaohsiung Customs had been dealing with a case of returning goods, which involved delayed declaration and abandonment of goods, when the containerized goods were found to be suspicious during a risk analysis. During the examination conducted on January 30, 2018, the front section of the container was found to be filled with frozen sardines acting as cover, while the back section was full of slaughtered pangolins, which had been descaled and gutted. A preliminary estimate indicated that there were more than 4,000 pangolins with a total weight of over 13,000 kilograms and a market value of about NT$30 million. The actual goods discovered were obviously not in conformity with the information entered in the shipping documents. 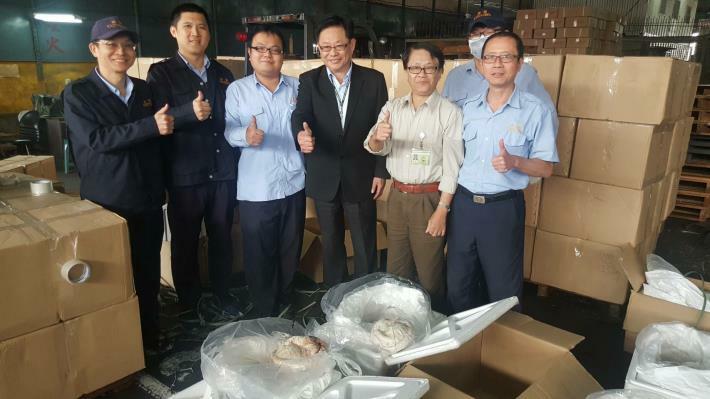 Kaohsiung Customs indicated that pangolins are one of the species listed in Appendix I to the Convention on International Trade in Endangered Species of Wild Fauna and Flora (CITES). Appendix I includes all species threatened with extinction which are or may be affected by trade. Trade in specimens of these species must be subject to particularly strict regulation in order not to further endanger their survival. In addition, being one of the species referred to in Article 4 of Wildlife Conservation Act, pangolins are also listed in Appendices I and II of Regulations on Import and Export of Endangered Species of Wild Fauna, Flora & Related Products declared by Ministry of Economic Affairs. According to Article 24 of Wildlife Conservation Act, no import or export of live wildlife or protected wildlife products is allowed without prior approval from the authorities. Violation of the article could lead to imprisonment for not less than six months and not more than five years, and/or a fine of not less than NT$300,000 and not more than NT$1,500,000. Kaohsiung Customs reiterated that poaching and trading of endangered wildlife for commercial purposes might not only result in natural resource disasters and extinction of species, but also bring about serious environmental problems and a damaged international reputation. Citizens are urged to show their support by neither consuming nor trading wild animals, and to report to the authorities if any sale of protected wildlife for profit is detected. Only then can wildlife be perpetually sustainable in nature. In the meantime, the public is encouraged to report any suspected smuggling activities to Customs by calling the toll-free number: 0800-711117.